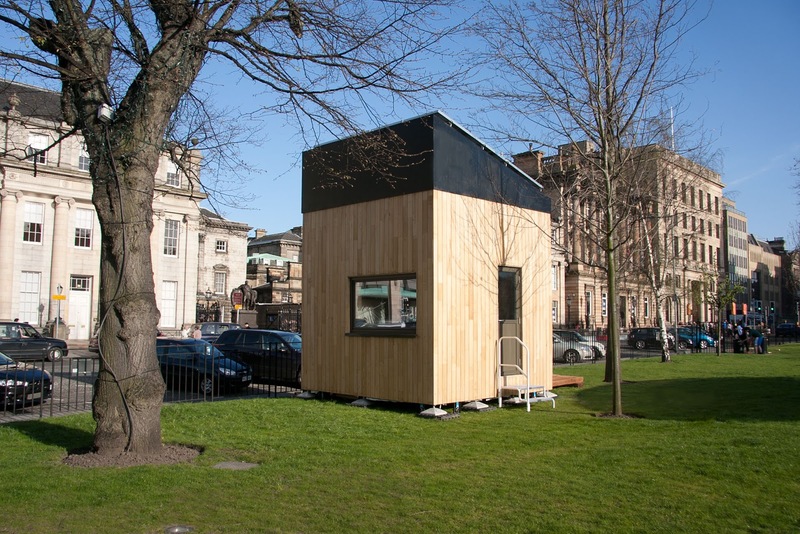 Researchers at the University have used the very latest technology to develop a carbon-neutral compact home called the Cube. Built from sustainable materials, mostly wood, it is designed to be comfortable and modern and includes a variety of cutting-edge products with low energy use. If registered for the UK Government’s feed-in tariff, the Cube would have no utility bills (other than for a water supply) and would raise around £1,000 per year in income. The Cube has an internal space of 3x3x3 metres and includes a lounge, with a table and two custom-made chairs, a small double bed (120cm wide), a full-size shower, a kitchen (with energy-efficient fridge, induction hob, re-circulating cooker hood, sink/drainer, combination microwave oven and storage cupboards), a washing machine and a composting toilet. Lighting is achieved by ultra-efficient LED lights, and the Cube is heated using an Ecodan air-source heat pump, with heat recovered from extracted air. It has cork flooring and there is two-metre head height throughout. Dr Mike Page, Director, CUBE Project, said: “The Cube Project is an attempt to show what is possible in terms of low-carbon living, with readily available technology. Other compact pods have been made, but this is the first to integrate the latest technology into the building to make it carbon-neutral over the year. The Cube is highly insulated, with a timber-frame shell, interior surfaces of birch plywood, and sweet-chestnut cladding on the exterior. It has a south-facing monopitch roof, covered with solar panels - when at its permanent home, the south wall is also covered with solar panels. This generating capacity is expected to make the Cube carbon-neutral over the year. The first prototype Cube, QB1, will be taken to the Edinburgh Science Festival, 9 - 23 April 2011, where it will be displayed to promote eco-friendly living and to showcase the various technologies used.